Both hot and cold water pipes should be insulated with heat tape or another insulator. The areas where the water supply lines are located – such as basement, crawlspace, and garage – should be insulated. Kitchen cabinet doors should be opened to allow warm air to circulate around the pipe system. A faucet in the property should be allowed to drip slightly. Running even a trickle can help prevent pipes from freezing. When leaving the home, the temperature should be set to no less than 10 degrees Celsius. The master valve to the home should be shut off. Ice dams form at the edges of the roof when the heat in the attic causes snow on the roof to melt, which in turn refreezes at the gutters. The gutters and downspouts should be regularly inspected and cleaned, to allow melted snow to properly flow through the drain system. The temperature in the attic must be kept between five to 10 degrees warmer than the outside temperature by providing insulation and ventilation in the attic. Having proper insulation in the attic prevents ice dams from forming on the roof. If insulation needs to be replaced, the damaged roof area should be repaired first. 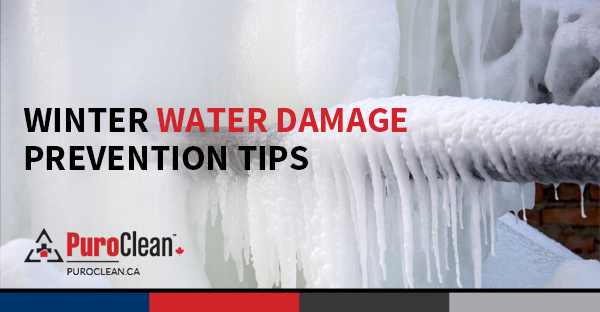 Heavy snow on roofs can cause ice dams and structural damage (cave-ins) to the roof. Snow should be removed when it’s about 15 centimetres deep, otherwise the thick snow can lead to property damage. At least 5 centimetres of snow should be left on the roof to avoid doing damage to the roof covering. Those who live in a one-story home should stay on the ground and use a rake with a telescopic handle to remove the snow on the roof. Rakes can also be used to clear the overhangs in taller homes. Those who are about to shovel snow from a roof should make sure the ladder is stable and that they have a safety harness. For sloped roofs, shoveling should start at the ridge and end at the eaves. As preparedness is key to face the hazards of winter, here are tips to prepare a roof for winter, and winter preparation tips for homes and properties. The PuroClean team stands ready to provide professional restoration services to any property affected by fire, water or mould damage.